It’s time to take three short walks around an immense open-air gallery! Down a street, in a square, round the city centre or out in the suburbs, more than a hundred frescos cover the walls in Lyon and retrace its history. Whether you’re in Lyon for a day or have lived in the city all your life, here are a selection of frescos, mostly designed and created by the Lyon-based company CitéCréation, which will pique your curiosity all while helping you discover Lyon. CitéCréation and its 80 painters, architects, landscapers, etc. have covered the walls of the world with artistic creations for more than forty years. Start with a magnificent account of the life of Lyon’s silk workers. The biggest fresco in Europe, La Fresque des Canuts (the Silk-Weavers' Wall), depicting the Croix Rousse district, is regularly updated! So the characters and structures change over the years. Fancy some fun? Look for the two parrots chatting on a wall and the painter nestled in his workshop! At the corner of bd des Canuts and rue Denfert Rochereau - 69004 Lyon 4 – Metro C stop Hénon. Fancy finding a fresco that is less well known but no less deserving of a visit? Pop along to admire Les routes de la soie (the Silk roads). This piece retraces the history of silk back over 3,000 years. 4 Rue Carquillat, Clos Jouve, Lyon 1 – Metro C stop Croix-Rousse. 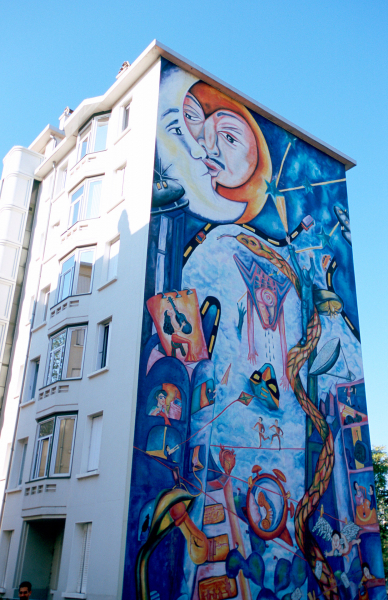 After taking a short cut down to Les Terreaux and exploring the sublime courtyards, admire the celebrities in the Fresque des Lyonnais célèbres (Famous Faces of Lyon Fresco). Paul Bocuse, the Lumière Brothers, Abbé Pierre, etc. 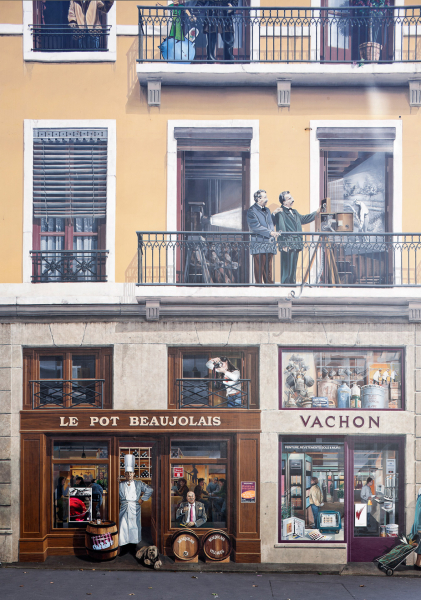 Can you spot these famous characters who helped forge Lyon’s reputation? Hey, not so fast! Turn round and check out the Tony Tollet Fresco, a Lyon-based artist. 2 rue de la Martinière, Lyon 1 – Metro A or C stop Hôtel de Ville or Saint-Paul bus stop. If you’ve got time, cross over Pont de Feuillée bridge to admire the Cour des Loges Fresco, a trompe-l’oeil curtain of a theatre set. 26 quai de Bondy / 3 place Ennemont Fousseret, Lyon 5. Travel through time and space thanks to the four unusual frescos we’ve selected for you! Let’s start by heading to the future: the Lumière Fresco depicts Lyon in 2046, with Tony Garnier Hall covered by a steel dome. Every evening, it is lit up from dusk to midnight thanks to 4km of optical fibres and 95 diodes concealed under the paint! 106 avenue Jean Jaurès - Lyon 7 – Metro B stop Jean Macé. Time for a change of scenery! Foxes, hedgehogs, owls, etc. This is a non-exhaustive list of the fauna and flora we live alongside, unaware, here in Lyon. Since 2011, the Action For Biodiversity Fresco has spotlighted this untamed nature surrounding us. Jean Macé school mural, 87 rue de Chevreul, Lyon 7 – Metro B stop Jean Macé. Following this, head off to Mexico with the Diego Rivera Fresco. Three trompe-l’œils, on two buildings at the top of the street, depict Mexico’s history through the eyes of the famous muralist. 19-25 rue Georges Gouy, Lyon 7 – Metro B stop Debourg. Head back to 1998 to celebrate France’s World Cup victory. 20 years later, the Gerland Fresco means just as much and will prove a real hit with football fans or anyone else looking to remember the French team’s summertime success! 16-18 rue Pierre de Coubertin, Lyon 7 - Metro B stop Stade de Gerland. It’s the perfect walk for visitors of all ages to get an idea of the many frescos in Lyon without having to go too far. Walk around the Ideal City, designed and created in the 1930s by Tony Garnier, avant-garde town planner, central figure of Lyon’s architectural and social history. This genuine open-air gallery of 25 murals covers the key concepts of the Ideal City according to Tony Garnier and his major achievements (Stade de Gerland, Edouard Herriot Hospital, Tony Garnier Hall, etc.). Why not visit the musée urbain Tony Garnier (Tony Garnier Museum), free with the Lyon City Card! 4 rue des Serpollières, Lyon 8 – Tram 4 stop Lycée Lumière. Just a stone’s throne away, you’ll find the Three Towers of Babel. Seen through the eyes of three artists: Pieter Bruegel the Elder (16th-century painter), Nicolas de Crécy (Lyon graphic novelist) and Coop HimmelB(l)au (Confluence museum architects), these murals teach you about the myth of the tower reaching the gates of heaven. Place Mendès-France, Lyon 8 - Tram 2 stop Jet d’Eau, Mendès-France. Plenty of time on your hands? Push on to the Montluc (39 rue du Dauphiné, Lyon 3 – Metro D stop Sans Souci) and Shanghai Frescos (23 boulevard des Etats-Unis - Lyon 8 - Tram 2 stop Jet d’Eau, Mendès-France). - Thank You Monsieur Paul : found in front of the eponymous Halls, this mural is lit up every evening, sharing a short history of Paul Bocuse with visitors. Halles Paul Bocuse, Cours Lafayette, Lyon 3 – Metro B stop Place Guichard Bourse du Travail. - Saint-Just Fresco : this features the remains of the successive basilica of Saint-Just, offering a fine view of Lyon. 9 rue des Macchabées, Lyon 5 – Funicular 1 stop Saint-Just. - Voyage dans la ville (City Travel): this fresco retraces the history of public transport in Lyon, from the first horse-driven carriage to the current underground system. 98 avenue Lacassagne, Lyon 3 – Metro D stop Grange Blanche. 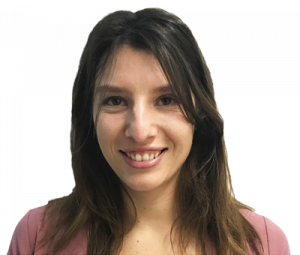 Always smiling, Mathilde comes to us from Franche-Comté (as her lilting accent attests). Besides, she is mad about Franche-Comté cheeses: comté, cancoillotte, mont d’or... And all things comestible, for that matter (she’s a real foodie!). Her secret to staying slim? Physical activity. She loves running along the banks of the Saône, near her home.Her motto? Run more to eat more!